They say travel changes you. Isn't that sort of like playing with fire? It can warm your bones, singe your skin, or consume your very marrow. Once you cross into that strange land, you never know who will return. And, there's no thermostat. You can't say, "Oh, I just want a little change, so I'll take a short trip." It doesn't work that way. A year-long, round the world journey might not make an iota's difference in your life, while an overnight trip to Hoboken could throw you into an alternate universe. I guess one way you could attempt to control the change that might come your way is to take home with you. In today's world, you can carry your favorite pillow to the far ends of the world and find your favorite fast food just around the corner in places that hardly have corners. You can travel with your posse, stay wired to family and co-workers, and never miss an episode of Orange Is The New Black. Some places, however, make it darn hard to carry that home bubble with you. San Miguel de Allende seems to be that kind of place and I'm beginning to wonder about the changes that will come my way over the next several weeks. I like my life and I'm not looking for transformation. Insights, enlightenment, deepening, clarity, and greater compassion would be great, however I can already feel new tendrils creeping into my cells and I know that I can't control what forms they take. 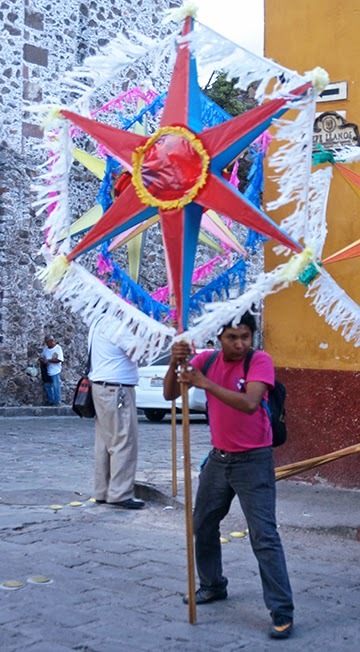 Today is a fiesta day in San Miguel … one of many … and I happen to be staying a few blocks from the center of the festivities. So, lured by the music and the promise of dancing and food, I followed the musical breadcrumbs to the heart of the celebration … the birthday party for the Virgin. 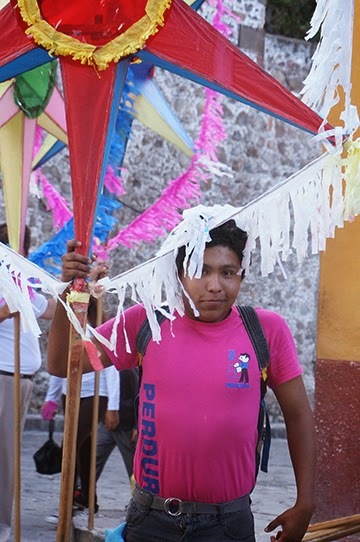 Fiestas are loud … bands, carnival ride music, vendors … and colorful … costumes, flags, banners, cotton candy, balloons. At one point, a bunch of men carrying large, colorful, hexagon "flowers" began to leave the area so I chased after them for about a block. One young guy spotted me trying to take pictures so he began to perform for me while I snapped the camera. He laughed. I laughed. Then I showed him the images and we laughed again. It struck me as I left that, if I had the power to direct the change that may appear, it would be related to this experience. I would like to feel free to have fun with total strangers. I would like to have that young boy's complete confidence and comfort in inviting a stranger into play.